Maybe they don’t know everything, the women with the divining sticks, but they sure know how to reel a girl in. Maybe they don’t see everything, but they do see you there on the beach, alone or in some laidback configuration, and somehow – they see enough. And so they come up to you as you’re rolling your jeans up or dusting your bum off, scrunching the newspaper your sundal came in and absentmindedly considering whether to litter, trash or recycle. And they look you in the eyes with a smile of recognition and say: “Nee ambulaiya poranthirikanum, ma!” You should have been born a man. Even later, when you find out that there’s nothing unique about this line, you will consider it a compliment, because it is meant as one. And the shore-side soothsayer will offer you this opening gambit as she takes your palm, because whatever else she knows or doesn’t, she can intuit you aren’t going to take it as an insult. Though later, you learn: some women who do terrible things to other women have been told it too. Other women who do worse things to themselves have been told it too. Are those also ways to be men, then? “Internalised misogyny,” you think. Women who should have been born men because maybe then they would hate themselves, and each other, less. But you don’t live anywhere but here. You live here in this city by the sea. With a long beach where you could be detained for holding hands at night. And by the brightness of day, you give yourself away because only someone who doesn’t mind sun-kissed skin would be loitering. Someone like you, a woman like a man. Count them and see how few they are, the women. How far between the canoodling (straight) couples and the water-shy families. While half-naked men splash around like they own this city, or indeed, this sea. “Should have been born a man”, you ponder – and you look at the transwomen who also mill about between stalls selling blackened corn and displaying balloons to shoot for prizes. And you wonder what the fortune-tellers say to them, though you don’t quite know how to ask. And not yet, not today, but soon – you may wander along that beach and arrive at the memorial of another woman who “should have been born a man”. And you’ll think of the crowds of men in white who surrounded her, and all the women still in their kitchens, whose lives she made a little easier. At first, when you were younger, you thought that all that the fortune-tellers meant with that provocative, alluring opening gambit was this: that you have courage in excess, a province you demurred was not exclusively male. Later you understood: if you were a man, in this place and in this time, what you could do with that courage would have multiplied. Or to put it another way, perhaps you wouldn’t have needed that much courage at all. An edited version appeared in The New Indian Express on December 8th 2016. “The Venus Flytrap” appears on Thursdays in Chennai’s City Express supplement. I have a piece in Kindle Magazine‘s “Cities” issue on Chennai/Madras, where I have lived since late 2007. Read it here. I’m so very delighted that my essay on femininity, fashion and exile, “Karaikal Ammaiyar And Her Closet Of Adornments”, from the anthology Walking Towards Ourselves: Indian Women Tell Their Stories (HarperCollins India/Hardie Grant Australia), has been republished in The Ladies Finger. I hope you’ll enjoy reading it. I counted myself among the lucky ones, while the city drowned. How lucky to be dry. How lucky to have water to drink, a toilet that flushed. How lucky to be parcelling food and not waiting for it. How lucky to be in my own clothes, and to have excess to give. And even when the power went out and took all lines of communication with it, how lucky to have little to do on a lightless night but to tell stories. In hundreds of cultures, there is a legend about a Great Flood. The most well-known one comes from the landlocked region of the Abrahamic religions: Noah, and his ark of animals. Strangely, the elements of this myth are echoed in folklore everywhere: from the Aztec story of Tapi to the Masai story of Tumbainot to the Alaskan story of Kunyan. The common tale is as follows: that the world is punished with a terrible deluge because of human wickedness, and a chosen person or family build a vessel in which pairs of animals also took shelter. After days or weeks at sea, they finally release a bird or beast that returns, bringing a symbol of hope and dry land. Hindu lore also contains a similar story: that of Matsya, the fish or fish-man, the first avatar of Vishnu. He warns Shraddhadeva Manu, a Dravidian king, of an impending deluge, and instructs him to build and fill an ark with animals, grains, seven sages and his own family – enough, as in every version of this tale, for a new world to come. There are plenty of other twists, other downpours and other tales. The Yuma of Southwest America have a flood tale which is also the origin story of the desert: a divine deluge is sent to eradicate dangerous animals, but when people insist that some of them must be kept for food, the waters are evaporated by a too-powerful fire. A beautiful Nigerian story goes that the moon and the sun were married, and their friend the flood demurs to visit their home but they insist; finally, the waters come through the doors and rise so high that the couple must live in the sky. In many South American flood stories, human survivors are turned into monkeys who slowly regain human attributes. Primordial water is the origin of all life. A flood myth is essentially a second chance, to recreate: what must we do, once the earth is once again beneath our feet? So many stories to tell by candlelight, in a storm, as one waits for the next opportunity to give, to get back out there and connect people, gather supplies, support the bravest among us all who wade into the worst-hit areas. I will not romanticise what it is like to wait, in that same darkness, for rescue. When the floodwaters abate, there will be other stories. Among them, most of all, will be stories of ordinary heroism; ordinary because the massive outreach effort that the people of Chennai have shown is how humanity should always be. It should be ordinary to care. It should be habitual to think of others. Flood stories are about destruction and punishment, but they are also about cleansing and renewal. They are about the obligation of survivors to question the methods of the past, and to build a future based on the wisdom of loss. 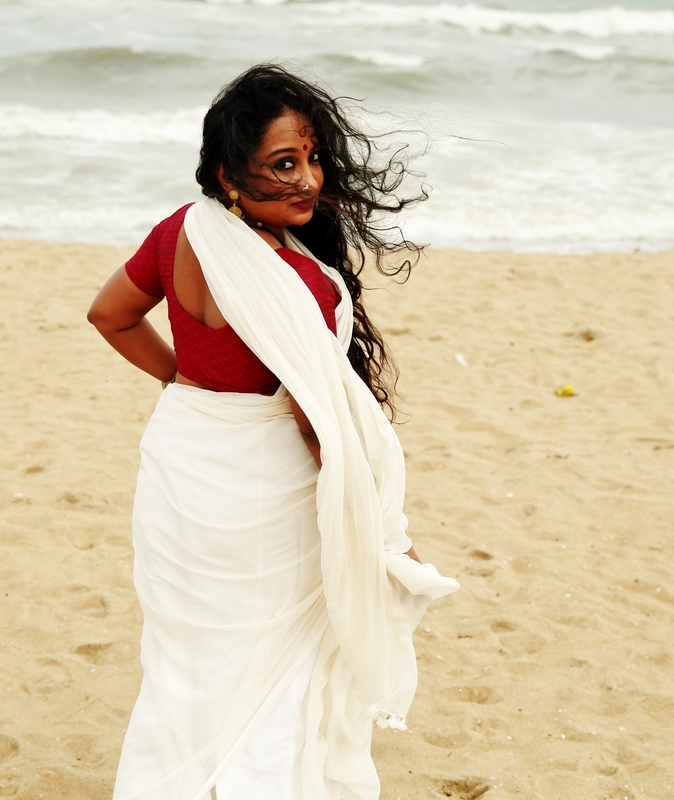 What will we do differently, Chennai, now that we know how much we want that difference? An edited version appeared in The New Indian Express on December 7th. “The Venus Flytrap” appears in Chennai’s City Express supplement. I saw the most beautiful bull a few days ago. Its hump was covered in a fabric of sea green sequins, its horns unpainted, and a dark, intense-eyed man held its tether. They were attempting to cross a curving one-way main road at the end of July, half a year away from the harvest festivals. I see myself as a manqué, with my folders of unfinished endeavors, rare dehiscences of poems and stories that sometimes make solo forays into the world yet remain uncollated. Abandoned by the muse, I have been forced to abandon my manuscripts. 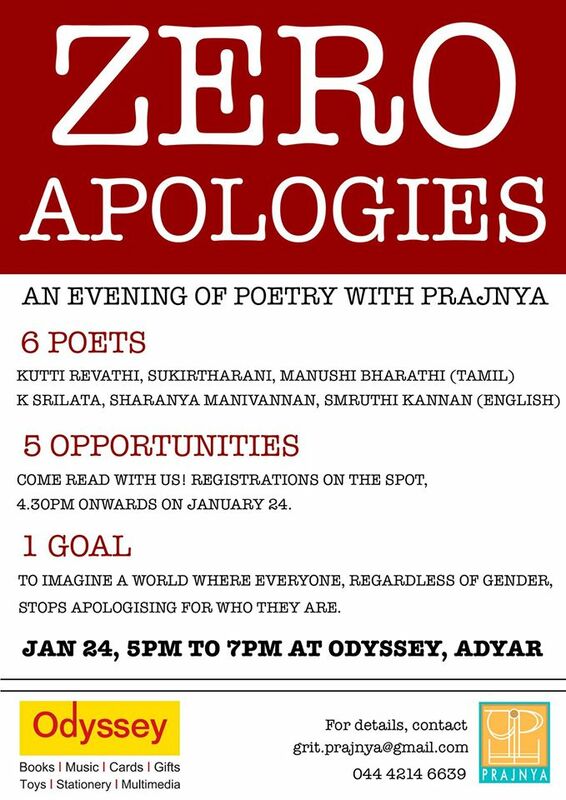 But among the five (yes, five) of them, the only one I suspect I may yet realistically finish is the one full of poems about Chennai. This is the place where I can encounter a beautiful bull for a few seconds and never find an explanation for why it was there. This is also the place where I have seen bouquets of live chickens hanging upside down from the handles of a motorbike, kids in a slum swinging in their mothers’ sarees on the day before laundry day, Narikuravar children performing balancing acts on the pavement while their parents sold beads below them. The city where the perigee moon rose out of the sea with false auspiciousness en route to an assignation, where I once spontaneously poured palmfuls of roses the colour of live coals into the ocean because that was the kind of evening it was – a confluence of sea and flowers and my need for a ritual. Where, with uncanny correlation, fortune-tellers routinely tell me I am the kind of woman who should have been born a man. 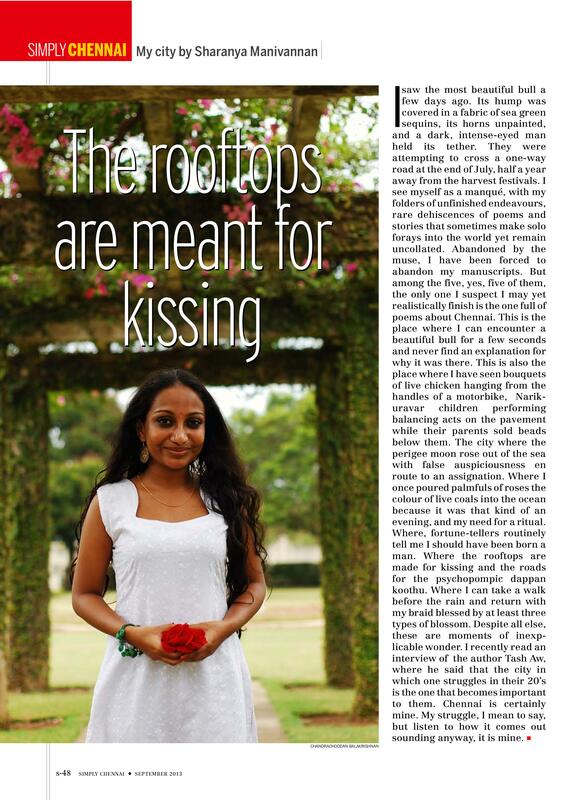 Where the rooftops are made for kissing and the roads for the psychopompic dappan koothu. Where disputed art deco houses still hold court as the streets around them change. Where I can take a walk before the rain and come back with my braid blessed by at least three types of blossom or leaf: and the miracle of being able to name some, and the miracle of being able to learn about the others. Despite all else, these are moments of inexplicable wonder. I recently read an interview with the author Tash Aw, in which he said that the city in which one struggles in their 20’s is the one that becomes important to them. Chennai is certainly mine. My struggle, I mean to say, but listen to how it comes out sounding anyway – it is mine. 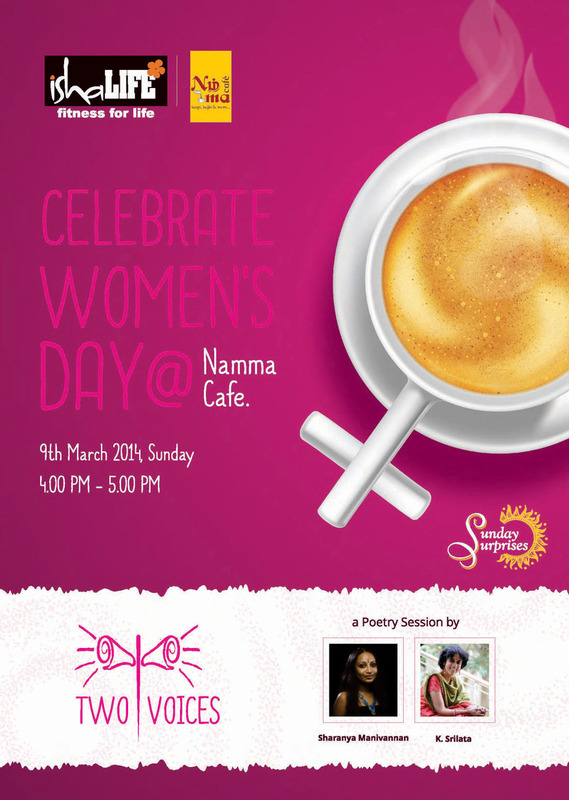 This appeared in India Today’s Simply Chennai supplement for their 8th anniversary issue.